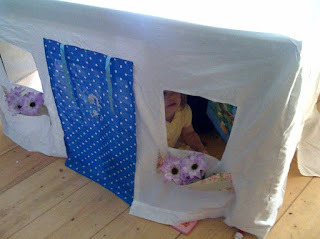 ...like Granddaughter Amelie's "under-the-table" house sewn from a sheet and some other material off-cuts by her Mum. It's even got window boxes with fabric flowers in them! I'm sure you have read and loved Vivian Gussin Paley. well, not all 27 books, but some. Lovely stuff.